7.9 on the Richter scale. The earthquake’s epicentre was 20km from Bhuj. A city with a population of 140,000 in 2001. The city is in the region known as the Kutch region. 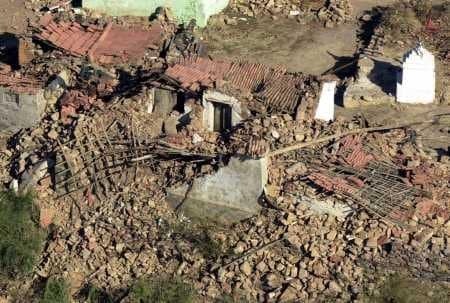 The effects of the earthquake were also felt on the north side of the Pakistan border, in Pakistan 18 people were killed. The earthquake was caused at the convergent plate boundary between the Indian plate and the Eurasian plate boundary. These pushed together and caused the earthquake. However as Bhuj is in an intraplate zone, the earthquake was not expected, this is one of the reasons so many buildings were destroyed – because people did not build to earthquake resistant standards in an area earthquakes were not thought to occur. 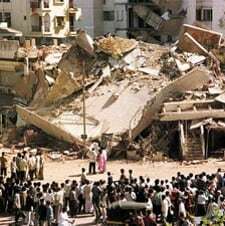 In addition the Gujarat earthquake is an excellent example of liquefaction, causing buildings to ‘sink’ into the ground which gains a consistency of a liquid due to the frequency of the earthquake. 56% of the total area of the Indian Republic is vulnerable to seismic activity. Gujarat: an advanced state on the west coast of India. On 26 January 2001, an earthquake struck the Kutch district of Gujarat at 8.46 am. Epicentre 20 km North East of Bhuj, the headquarter of Kutch. The Indian Meteorological Department estimated the intensity of the earthquake at 6.9 Richter. According to the US Geological Survey, the intensity of the quake was 7.7 Richter. The quake was the worst in India in the last 180 years. Casualties: loss of life and injury. Disruption of transport and communications. 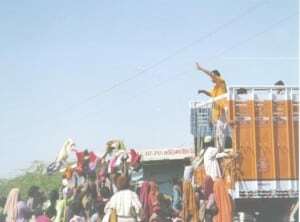 The earthquake devastated Kutch. Practically all buildings and structures of Kutch were brought down. Ahmedabad, Rajkot, Jamnagar, Surendaranagar and Patan were heavily damaged. Nearly 19,000 people died. Kutch alone reported more than 17,000 deaths. 1.66 lakh people were injured. Most were handicapped for the rest of their lives. The dead included 7,065 children (0-14 years) and 9,110 women. There were 348 orphans and 826 widows. Initial estimate Rs. 200 billion. Came down to Rs. 144 billion. 80% of water and food sources were destroyed. The obvious social impacts are that around 20,000 people were killed and near 200,000 were injured. However at the same time, looting and violence occurred following the quake, and this affected many people too. On the other hand, the earthquake resulted in millions of USD in aid, which has since allowed the Bhuj region to rebuild itself and then grow in a way it wouldn’t have done otherwise. The final major social effect was that around 400,000 Indian homes were destroyed resulting in around 2 million people being made homeless immediately following the quake. Geographic pattern of ground motion, spatial array of population and properties at risk, and their risk vulnerabilities. Low population density was a saving grace. Total damage estimated at around $7 billion. However $18 billion of aid was invested in the Bhuj area. Over 15km of tarmac road networks were completely destroyed. In the economic capital of the Gujarat region, Ahmedabad, 58 multi storey buildings were destroyed, these buildings contained many of the businesses which were generating the wealth of the region. Many schools were destroyed and the literacy rate of the Gujarat region is now the lowest outside southern India. Rs. 99 billion – deduct a third as loss of current value added. Adjust for heterogeneous capital, excess capacity, loss Rs. 20 billion. Likely to have been Rs. 15 billion. Differentiate among different taxes: sales tax, stamp duties and registration fees, motor vehicle tax, electricity duty, entertainment tax, profession tax, state excise and other taxes. Shortfall of Rs. 9 billion of which about Rs. 6 billion unconnected with earthquake. Expenditure:Rs. 8 billion on relief. Rs. 87 billion on rehabilitation. ...an Engineer and Tutor. Anand Paul is a bridge engineer at ch2m Global Design Center, Hyderabad. He is responsible for regional and local design projects. Committed to quality and timely delivery, he has been assigned multiple domain projects in Middle and India. Being a programmer, he is leading in-house spreadsheet development team. Apart from his routine, he runs CivilDigital.com, an exclusive Civil Engineering website.